HowToRepairGuide.com: 2005 Lexus SC430: Retractable hard top will not come down and Trunk will not open? The Roof Top is Stuck up and will not close,it will not come down.And at the same time the Automatic Truck release Function is not operating.The Trunk will not release automatically bu its interior inside latch.But the Trunk operated properly with Key. In some of this cases its seen that Gas door will not get open. The First thing to be checked in this case is Fuses. The fuses that control the gas door opener also are the same fuses that feed the trunk opener by way of the trunk ECU. Below are a list of the fuses that control the power inputs to the luggage compartment lid and the retractable top also. The unfortunate part is these fuses are located in the fuse box in the luggage compartment on the left-hand side. If you cannot manually open the luggage compartment to gain access to these fuses you will not be able to check them for power. Yow will there are four yellow in a row each marked 20 and one red marked 10. For more Easy Understanding,i will say ECU means.Electric control module or Engine Control Module.There are several ECU on this model. That is an acronym for the computer there is a trunk electronic control unit. The junction block with the fuses is also electronic control units i.e. ECU for the luggage compartment there is also a sliding or retractable roof ECU right near it. Click the link below for a better view. There are a couple of limit switches it would have to be inspected there's also multiple fuses with the trunk opener which also control the gas door opener. Usually if any of these fuses were interrupted it would also affect multiple other components in the car. This car uses body Multiplex and communications. If you have access to a scan tool that will interface with the body control computer there may be codes set in there that could give us some insight as to what is causing the retractable roof to not disengage and retract. The fuses should be listed on lid on the fuse box. LGG stands for luggage. Pull those four fuses to see if they are bad. Two of the fuses are for the luggage compartment and two of the fuses are for the sliding roof. Ideally if you have a 12 V test light or a voltmeter it would be good to know whether not you have power to those fuses with the key on or off. For More Help I suggest you to read this very Important Details. Here is the setting or activation criteria that will not allow the roof to open. Also make sure that you check the bypass switch in the glovebox that will keep the trunk lid from opening. This information can also be read in Lexus owners manual. The luggage cover in the trunk is properly set. The trunk lid is closed. and the retractable hardtop will not activate. However, if the indicator blinks and the retractable hardtop does not activate even with all the conditions above fulfilled, perform either of the following and then open the retractable hardtop. Put the selector lever in "P". 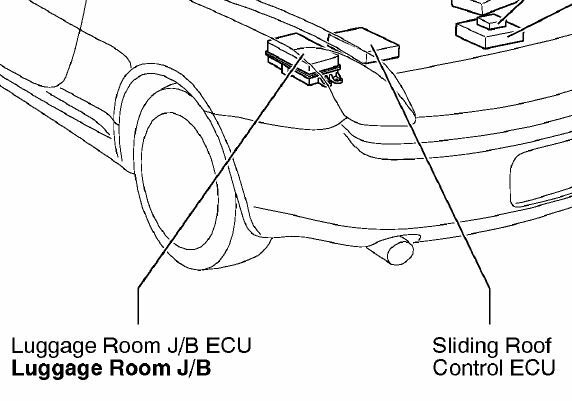 If the indicator remains on or off with the switch pushed, and the retractable hardtop does not activate, have your vehicle checked by your Lexus dealer. the retractable hardtop is opened fully, the side windows will close. If the quarter windows are not opened completely with the retractable hardtop fully opened, hold down the switch on the "OPEN" side again. The quarter windows will be opened.